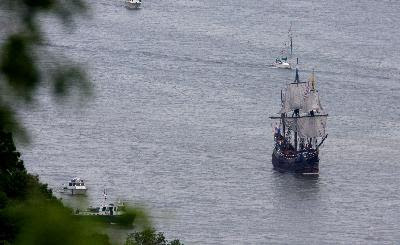 A year long celebration of Henry Hudson's voyage up the river that bears his name began a couple of months ago in Amsterdam, but officially gets underway here this weekend when The Half Moon (a replica of Hudson's ship) leads a flotilla up the river to Albany. The impressive fleet will retrace Hudson's 1409 journey in search of a Northwest Passage to China. New York and the Netherlands have staged a series of exhibits and events in both places along the waterfront, at botanical gardens, museums and architectural landmarks, to make this an excellent occasion to reflect on New York's Dutch roots, and to honor the many contributions of early Dutch settlers and why many sites, streets and parks bare their names. How did an English sailor happen to arrive here as captain of a ship owned by the Dutch East Indian Company in 1409? Take a walk through the Dutch Rooms of the Metropolitan Museum's European Art Collection; notice the many portraits of prosperous soberly clad businessmen and their wives by Rubens, Van Dyck, Rembrandt and Frans Hals. They are the visible evidence of the wealth of Amsterdam, Haarlem and the Dutch Republic in the 17th century. Surrounded by water, ships and trade were the life blood of their economy; they were one of the first with the idea that a quick way to China could be found around the Artic Ocean's ice. Such a trade route would have made Dutch merchants even richer than they were. The man they sent in search of the "Northeast Passage" was Captain Henry Hudson. We know he never found China, but his voyage gave Dutch settlers the right to lay claims to what would become New Amsterdam. Near the entrance of the Museum of the American Indian, you will find a sculpture that marks the spot where Peter Minuit in 1626 made a deal with the Mahican tribe to purchase Manahatta -"island of hills." Before your calendar becomes crowded with summer activities check the Henry Hudson 400 website now and plan to attend many of the events scheduled throughout the five boroughs; one that will give you a chance to climb abroad the Half Moon and experience what it might have been like to sail such a small ship on the high seas is at the Atlantic Salt Company maritime festival on Staten Island, August 29th. Directions: From Times Square MTA 1 to South Ferry, R, W to Whitehall, short walk. Ferry to Liberty Island departs from South Ferry.